Underworld Transmissions is Aural Hypnox label series, filmed and captured on tape in the private séances held in our subterranean lodge located in Oulu, Northern Ostrobothnia. The concept is to invite artists from the Helixes collective, in different combinations, to join a séance and through sound and movement to establish an elemental communication. In greater sense, apart from personal goals, the séances aim to bring forth the seasonal currents of the lodge; the undertone of the Aural Hypnox label and the artists involved. Each séance is guided by a unique automatic-portal-portrait reflecting the planetary and stellar distances seen at that particular time in the lodge altar mirror-receiver. 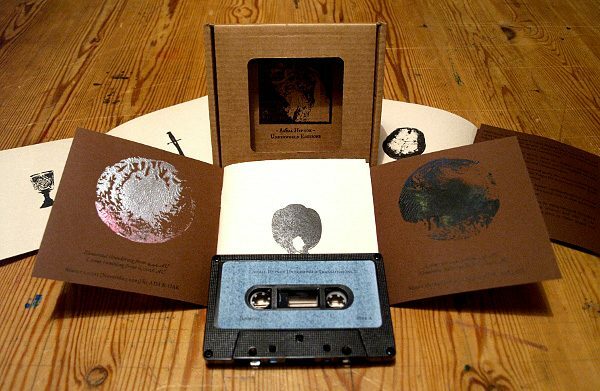 The cassette is released under our Underworld editions and is limited to 50 copies. It is packed inside a stamped cardboard covers, including a special 10-panel booklet with unique ‘séance’ -stamps. Total running time: 19:20.